The Carleton University FIRST Robotics Alumni & Mentoring Association, aka CU FIRST, is overjoyed by the recent announcement that Carleton University will be playing host to a FIRST Robotics Competition Ontario District Event in the 2020 season! 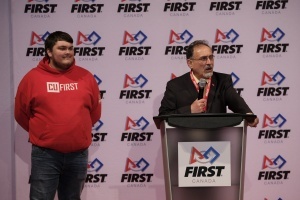 At the 2019 FIRST Ontario Provincial Championship in Mississauga, Dean of the Faculty of Engineering & Design, Dr. Fred Afagh, along with the President of FIRST Robotics Canada, Mark Breadner, and our very own President, Anthony Caliciuri, made the news official during the event’s Closing Ceremonies. The event is scheduled to take place next Spring, from Friday March 13th to Sunday March 15th, 2020. 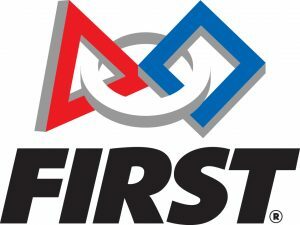 FIRST Robotics participants, parents, mentors and alumni across Eastern Ontario have been eagerly awaiting the introducing of a local event to the Ontario District, and CU FIRST is thrilled that the action, intensity, and excitement of competition will be coming to our campus! Not only will existing Alumni & Volunteers finally be able to contribute to an event locally, this represents an amazing opportunity to introduce new people to the world of FIRST. We’ve always said that the best way to understand FIRST and their mission is to experience spectacle of competition first-hand. CU FIRST was conceived, in-part, to facilitate the creation of a FIRST Robotics Competition event in the National Capital Regional. With that goal now accomplished, the focus will now shift to aiding the Planning Committee, in addition to continuing support for local FIRST teams, connecting members with Mentoring and Volunteer opportunities, and organizing community events, like the 2020 Ottawa FRC Season Kickoff. Stay tuned for more information as it becomes available! In the mean time, you can view out the official Press Release from Carleton University, follow CU FIRST and the Faculty of Engineering & Design on Social Media, and check out the announcement video below, featuring our very own 2018/19 President, Anthony Caliciuri! 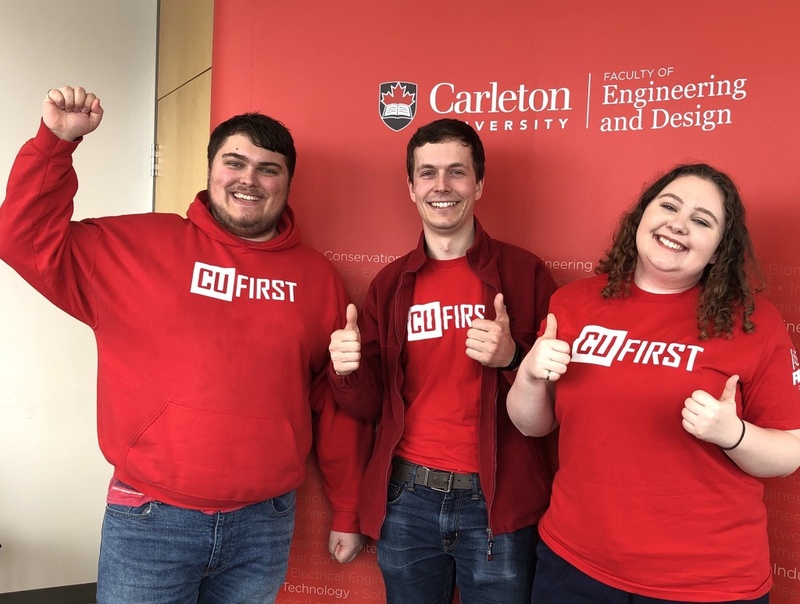 Founded in 2015, CU FIRST aims to promote and expand FIRST and their robotics-based educational programs for children both on-campus at Carleton University, and across the National Capital Region. As an official FIRST Alumni Collegiate Group, we provide resources and assistance to University and College students that previously participated in a FIRST program, helping them make the transition to become Coaches, Mentors, and Volunteers, giving back to the community and helping to foster the next generation of scientists, engineers, mathematicians, and artists. We also maintain close relationships with area teams and event planning committees across Eastern Ontario to provide as much support as possible and ensure continued growth in the region. Through strong partnerships with both FIRST Robotics Canada and the Carleton University Faculty of Engineering & Design, we organize community events, such as the annual Ottawa FRC Kickoff in early Janaury, provide assistance to local competitions, such as the Ottawa FLL Tournament in early December, and offer services to our membership, such as Travel Grants that allow Mentors and Volunteers to attend FRC District Events across the province. Through these initiatives, relationships and our passion for STEAM (Science, Technology, Engineering, Arts, and Mathematics), we hope to build and maintain a strong FIRST presence in Ottawa for years to come. FIRST® (For Inspiration and Recognition of Science and Technology) was founded in 1989 to inspire young people’s interest and participation in science and technology. Their mission is to inspire young people to be science and technology leaders, by engaging them in exciting mentor-based programs that build science, engineering, and technology skills, that inspire innovation, and that foster well-rounded life capabilities including self-confidence, communication, and leadership. FIRST Founder Dean Kamen is a prolific inventor, entrepreneur, and tireless advocate for science and technology. His passion and determination to help young people discover the excitement and rewards of science and technology are the cornerstones of FIRST. For over 30 years, Kamen has resolutely led the growth of FIRST to where it is now universally recognized as the leading, not-for-profit STEM engagement program for kids worldwide. FIRST is “More Than Robots”. FIRST participation is proven to encourage students to pursue education and careers in STEM-related fields, inspire them to become leaders and innovators, and enhance their 21st century work-life skills. Read more about the Impact of FIRST.